Infuse your home with the traditional design of this stationary sofa. 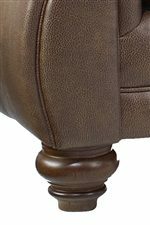 Classic details shown in the bun wood turned feet and rolled arms create an elegant design. Three padded seat cushions and soft back cushions provide a cozy and inviting place to sit. Add this classic sofa to your living room and pair with the matching loveseat for a sophisticated room. Fabric texture and shine may differ from what is shown. Visit us in store to see actual fabric swatches. 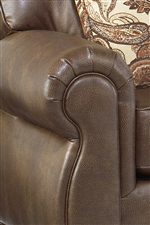 The Fitzpatrick Traditional 3-Seat Stationary Sofa by Best Home Furnishings at Best Home Furnishings in the St. Louis, Chesterfield, St. Charles, MO & Waterloo, Belleville, Edwardsville, IL area. Product availability may vary. Contact us for the most current availability on this product.